Traders work on the floor of the New York Stock Exchange (NYSE) in New York, U.S., on Monday, Dec. 31, 2018. A U.S.-China trade deal, less bad corporate earnings or positive economic reports could all be catalysts to push stocks back to their all-time highs. Analysts may not agree on the timing, but they do agree there are positive signs in the market that show the bull market still has legs to carry it higher. Economists expect to see 180,000 jobs were created in March, when payroll data is released on Friday morning. This follows February’s stunningly weak employment report, with just 20,000 jobs added. On Wednesday, ADP reported 129,000 private sector payrolls for March, below the 170,000 target, suggesting March’s government report could also be lower than expectations. 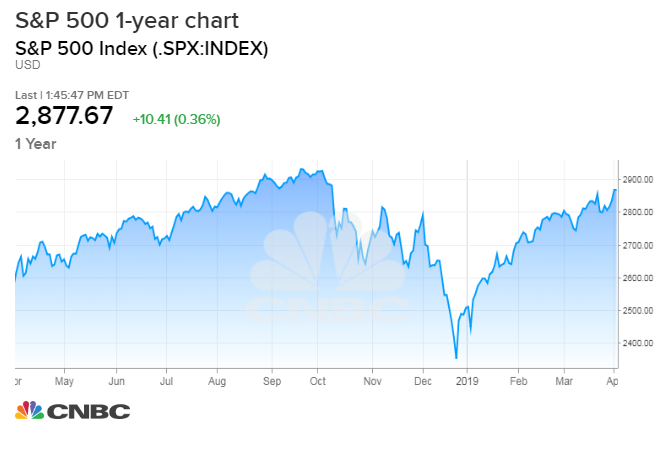 While investors continue to weigh economic reports, technical analysts say there are some very bullish signs for stocks, including the fact that the advance/decline line, showing more stocks gaining than losing, is at a record level. Robert Sluymer, technical analyst at Fundstrat Global Advisors, said he views the advance decline line as a positive sign for market breadth, but he also sees some pitfalls ahead. 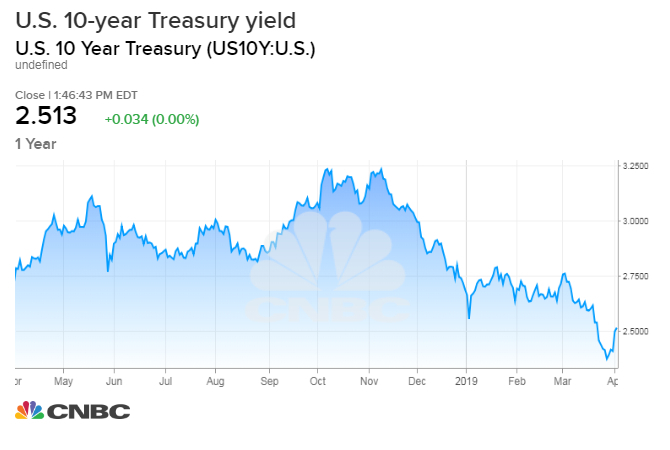 Sluymer and other analysts said another positive for the market is the reversal in Treasury yields, after an inverted yield curve two weeks ago sent recession fears across the markets. Sluymer said yields, which move opposite price, appear to be in a bottoming process. The curve inverted, when the 10-year Treasury note yield fell below the 3-month yield. On Wednesday, the 10-year was at 2.51 percent, well above the 3-month yield of 2.43 percent. Evercore called the move in the 10-year a ‘bullish reversal’ off of well-defined support at 2.40 percent. Ari Wald, technical analyst with Oppenheimer, said at this point, the bond market is the most important topic on his radar. “The message from the bond market, it’s not positive. The silver lining for us is it’s more to do with lower rates overseas and less about he fear of disinflatin in the U.S.,” he said. Indeed, U.S. yields did follow global rates lower, and the 10-year German bund continued to trade with a negative yield Wednesday. “We would like to see rates begin to stabilize. If they did that, more cyclical areas of the market would perform better and we would have much better leadership to propel this market higher,” Wald said. “The January low was 2.54 percent. That was the prior break down level. Prior support becomes resistance,” he said. Wald said positive internals could lift the market to new highs, but it’s not clear when it will get there. The Russell 2000 was trading at 1,566 Wednesday. Scott Redler, partner with T3live.com said the market has passed through most technical hurdles on its way back to record territory, though he said some selling could kick in as the S&P 500 crosses the 2,890 or 2,900 level. Redler, who follows the short term technicals, said lightening up at that level would be better than adding, though it’s possible the S&P could break through there and head back towards 2,940. “We could definitely pause there and wait for first quarter earnings,” he said. As for the high of the years, “It does feel like we’re going to get there in some shape or form. It’s just a matter of earnings or earning season, whether we can sustain above it. We’ll need to have decent earnings, and pretty good guidance.” Earnings are expected to be flat to lower for the fourth quarter. Redler said there are other signals he’s watching, including how China’s domestic stock markets are faring. The Shanghai is now up more than 28 percent year-to-date, and Redler said the U.S. is following it. Both U.S. and Chinese stocks were higher Wednesday amid optimism about progress in trade talks. Redler said he was also encouraged by the move lower in bond yields. Peter Boockvar, chief investment officer at Bleakley Advisory Group, said the stock market was in a totally different mode a year ago and there are some less favorable factors now. “Going into 2018, you had the euphoria of the tax cut, all this synchronized growth story and you had the Fed raising rates but that was in the background,” he said. “Now, you have the global synchronized slowdown. You have the tax cut wearing off, and you have the impact of the SALT deduction affecting spending in some areas of the country, and you have earnings expectations falling.” SALT refers to the change in how much tax payers can deduct for state and local taxes, which is now viewed as a penalty for residents of high tax states. Paulsen said investors could be lured in if the market hits new highs. “If you get to new highs, you could get people thinking the water is safe for the first time, and that’s about when you get a correction,” he said.